Do you have a jewelry "uniform"? The same set of rings, necklaces, and earrings that you put on everyday - almost without thinking? Aside from the occasional piece of "statement" jewelry, I have a typical "uniform" I wear everyday: a simple, small diamond from John, my engagement ring and wedding band, a Monica Vinader ring, and whatever watch I decide to wear that day. In the fall, I like to wear a lot of delicate, gold jewelry. I loved this Evil Eye Necklace from online boutique sixforgold so much (and apparently, you guys did too, because it sold out shortly after I wrote about it! ), I went back to the shop and picked out a couple more pieces from US jewelry designer, a.v. max - and they've now become a part of my autumn jewelry uniform. If you follow me on Instagram, then you'll know that I'm a huge fan of bracelet stacks. I end up taking a lot of them off when I get to work so they don't constantly bang on my desk, but I feel most confident when I've got a good, weighty stack on my left wrist. This pretty, a.v. max Rhinestone Arrow Bangle from Six For Gold is one of my favorites to wear. It's bendy, so it slips on easily (but I get paranoid about it slipping off, so I have to be careful!) and it's much better quality than similar bracelets I've eyed up elsewhere. It looks equally great when layered with a black or gold/rose gold watch and it doesn't get in the way when I type. And although I like pretty, delicate jewelry, I also like jewelry with a bit of edge, which is exactly what came to mind when I saw this Pearl Claw Necklace. Honestly? I've been wearing it almost every day - sometimes on its own, but often along with the Evil Eye Necklace. It looks great against black (which I wear a lot of in the fall/winter months) but I also love the way it sits on top of a white blouse. I also love these two pieces because they're so unique - I haven't seen anyone else wearing them yet! As a treat, sixforgold is offering Angloyankophile readers 15% off across its collections with the code ANGLOYANK15 (I don't really want to say the C-word, but ... Christmas is coming up, and it might be an ideal time to browse! #justsaying). Happy shopping! My Rhinestone Arrow Bangle and Pearl Claw Necklace were generously provided by sixforgold, whose jewelry I love and wear. All opinions are my own. Oh wow I love those necklaces, I want to pick them up straight away! They're so unique and cool and I like the hints of colours in the evil eye one. I'm glad you like it too, Rachel! I've been wearing it almost every day. I go through phases too ... 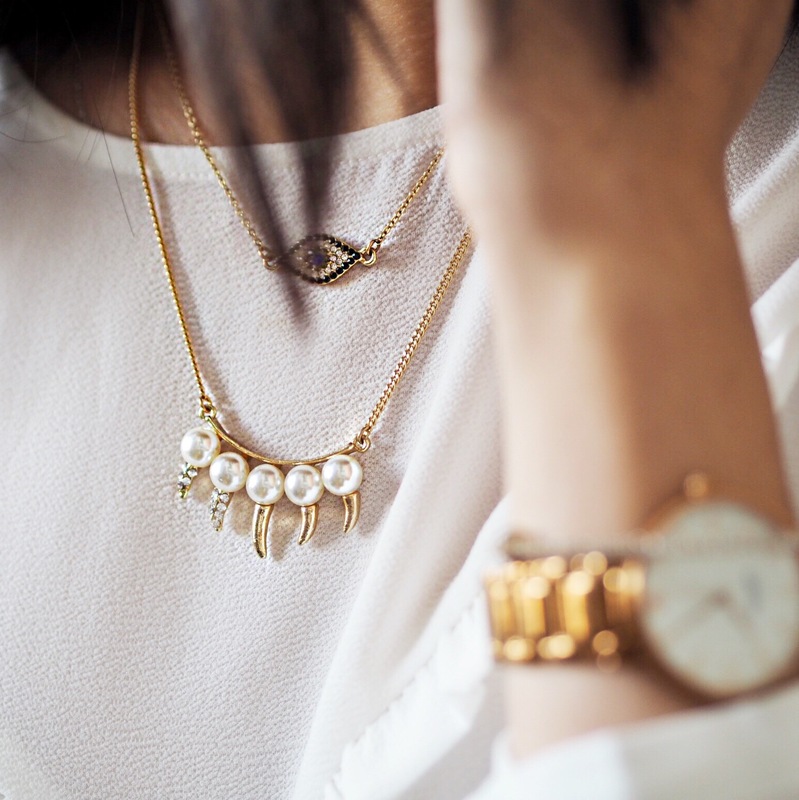 I'm pretty swayed by trends when it comes to costume jewelry, I must admit! And I'm EXACTLY like you ... when I get something new, I wear it to death!